Ever since Baker Bob was a little boy he wanted to be a baker. He loved when his mother made cakes and pies and knew that when he grew up, he wanted to do that too. His dream came true. 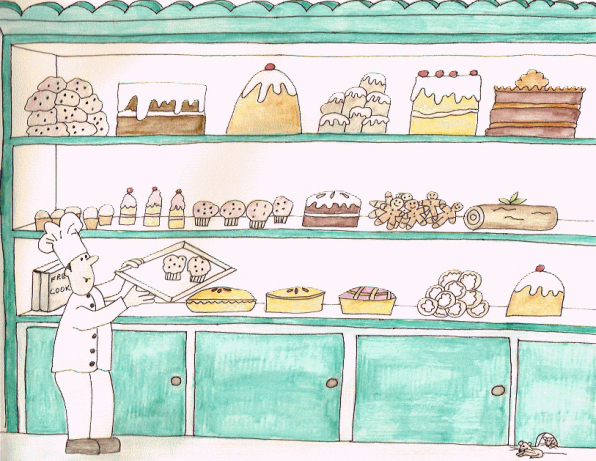 He owned his very own bakery, Bob's Bakery. Every morning he baked fresh bread, pies, cakes and pastries. He put them on the shelves and smiled when boys and girls came in with their parents. Their eyes always sparkled and he usually gave them a cookie. “I think I want to be a florist. I love flowers. I love the way they smell and look,” Christopher said. Every day he made a few wedding cakes and birthday cakes. His son, Christopher, the florist, brought over fresh flower petals. They spent time together decorating the cakes. Everyone in town thought Baker Bob's cakes were the most beautiful cakes in the whole city. “I have you to thank, son, for coming up with that marvelous idea. Now we are working together, just like I wanted.” Baker Bob hugged his son. Baker Bob couldn't be happier. Christopher couldn't be happier. Both of them enjoyed doing what they wanted and spent time together as father and son.